This article traces human development from its beginning as a soul created by God to realizing one’s ultimate potential of at-onement with God. Several resources are drawn on including the biblical record and other inspired material. Each human being consists of soul, spirit body, and physical body. The soul is where all that makes us human is stored and which survives death and continues into a spirit world and finally to an at-onement (union) with God, where it originated. Many spiritual thinkers understand human development as originating with God and returning back to God. Indeed, we are spirit beings having here on earth a very temporary physical experience during which individuation occurs and personality develops. Human development starts with a soul. Souls can be viewed as thoughts of God, i.e., God’s creations in a similar way that an author creates characters for a book. The souls are morally perfect and pure the way our first parents were before they sinned. The Bible confirms that God knew us from the womb and created our inmost being (soul). The soul possesses no free will at this initial stage, only an instinct to incarnate. Each soul consists of two complementary halves – male and female – each of which incarnates into a separate individual. These two individuals are soul mates and will often be reunited, if not in the physical life, then in the beyond. Upon conception, during prenatal development, and after birth, the pure soul absorbs the often damaging emotions of the mother and family. It slowly develops encrustations of human emotions corresponding to those of its family environment. By age seven, the soul of the child begins to develop its own individuality, but its condition is still influenced by that of the parents. As a container of emotions, the soul (or heart) can influence the person’s state of health and life expectancy. It is now understood that the emotional encrustations acquired prenatally and in childhood will form a heart wall. 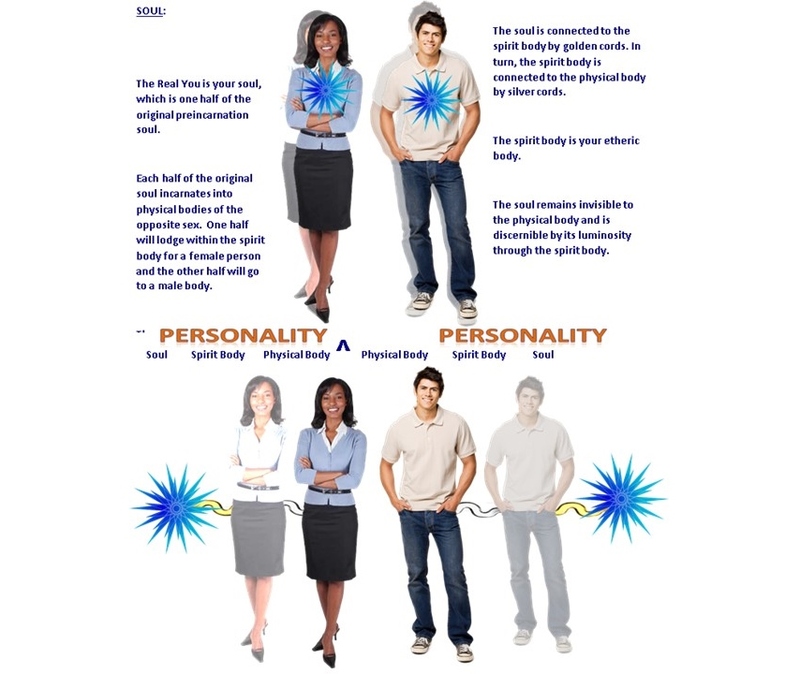 This hinders a person from expressing and receiving love, but the good news is, the heart wall can be dismantled by using a simple energy technique. 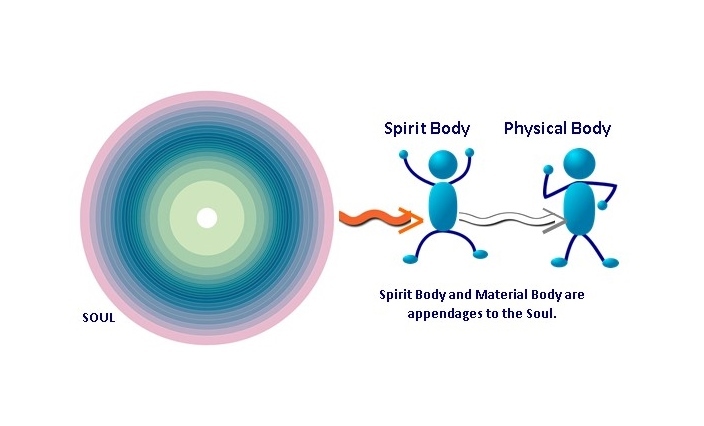 So in the human development, our existence begins with a God-created soul (also called spirit of man or breath of man in the Bible ), which contains the life force to give life to the spirit body and in turn to the physical body. The physical body is the starting point for experiencing our being. It is connected to the spirit body and soul by a so-called silver cord. When the silver cord is broken, the physical body is disconnected from the life force in the soul and death occurs. At that time, the spirit body with the soul returns to the spirit world and the body disintegrates into its constituent elements, or using Bible language, turns to dust. Humans can embark on one of two paths towards spiritual purification and perfection. This process will begin to reverse the encrustations and defilements that the soul has experienced through its incarnation. Firstly, the individual can embark on the path of developing and perfecting their inherent natural love. This is achieved by first accepting and loving themselves and then consciously extending kindness and goodwill to others. This will greatly increase their happiness, reduce their suffering, and help those around them. Human love is vital for keeping the world together. The ultimate level of this development is reaching that state of perfection as was in the first parents before they sinned. However, human love is not entirely trustworthy. The second and superior option is to seek the Divine Love, which is available from God for the asking. With sincere prayer, God responds by sending the Holy Spirit, the instrument which opens the soul and imparts the Divine Love. The soul then begins to be transformed from the purely divine image into divine substance. In the process, it is acquiring divine nature and becoming more and more at-one with God. This eventually results in the new birth. 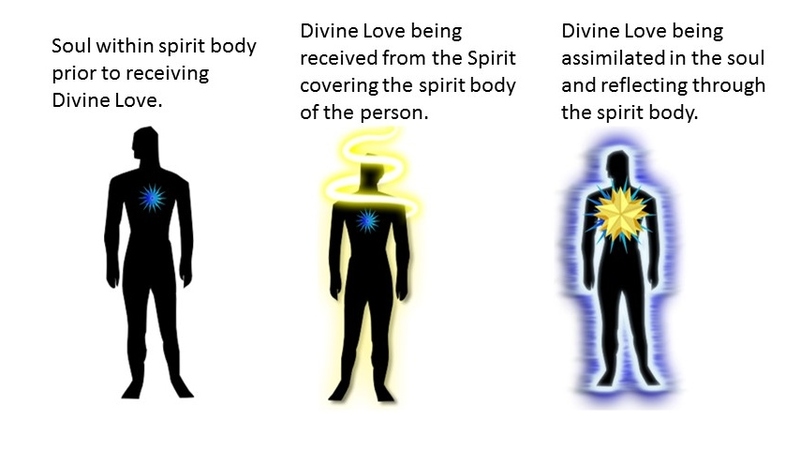 Upon passing into the spirit world, the individual is qualified to enter the Kingdom of God or Celestial Heaven. 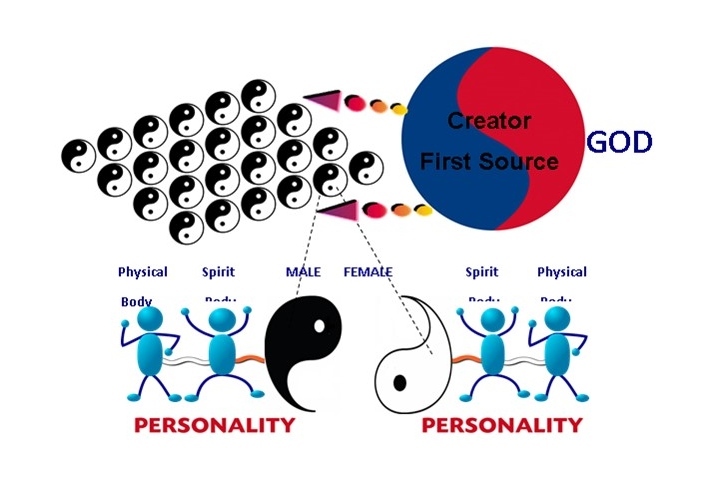 Below is a graphic representation of this process, showing how we all start as an unincarnated soul, become individualized humans and can, if we so choose, reach an incredible divine destiny.